C-23A: 18 aircraft ordered by the USAF. When the C-23As were withdrawn from use eight were transferred to the US Army, ten were sold on the civilian market. Of these four were sold on the civialian market, one aicraft crashed and three were stored. C-23B: 16 aircraft ordered by the USAr. All the C-23Bs were upgraded to C-23C. Of these nine were sold on the civilian market (three to NASA) and seven aircraft stored. Four of the stored aircraft are assigned to be transferred to the Philippines. C-23B+: 28 aircraft purchased from the civilian market. One aircraft crashed. 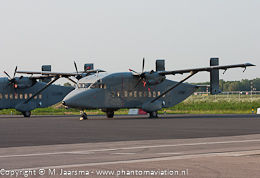 C-23C: Upgraded C-23B and C-23B+ Sherpa's with 43 aircraft converted. Two aircraft upgraded to C-23D, one aircraft crashed, nine sold on the civilian market and 26 aircraft stored. C-23D: Upgrade program for the C-23C which got cancelled with two C-23Cs upgraded. One aircraft sold on the civilian market and one stored at AMARG. Will purchase four former US Army C-23s currently stored at 309th AMARG at Davis-Monthan AFB, Arizona. Interest in buying four C-23Cs currently stored. 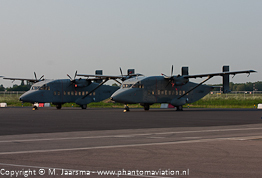 US Army C-23Cs on the ramp of Rotterdam-Den Haag airport in 2006.